This week i’m going to be posting a Japan photo every day. No theme – i’ll be using it as a chance to share things that maybe wouldn’t have warranted a post all to themselves and whatever rambling memories may come with them. 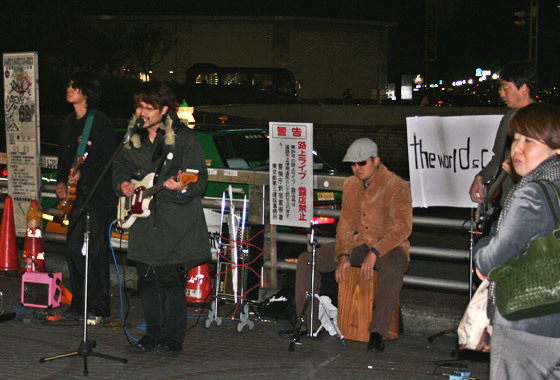 Todays photo is a band called The Worlds Code. This was taken outside Shinjuku station just outside Lumine 2 on November 2nd 2007 while we were strolling about taking in as much as we could before the flight home. It was a little sad for us as all the stores were putting their Christmas decorations up – our Tokyo adventure was at an end and life was going on without us. Coming across these guys on our way back to the station was a really pleasant surprise, check them out at their myspace page and official website.